Overtime the use of chloride salt control products for winter conditions (i.e. deicers) has caused growing concern over environmental impacts to nearby ecosystems, with gradual increases in overall salinity becoming present over extended periods of time. This trend holds potential negative consequences for freshwater resources and ecosystems throughout NH and the U.S. This project is designed to assess the impacts of highway and road maintenance as well as land use, development, and storm water runoff on surface water quality and freshwater biota. We focus on the effects of chloride and stream temperature on stream biota, using benthic macroinvertebrates as eco-indicators of ecological stress. 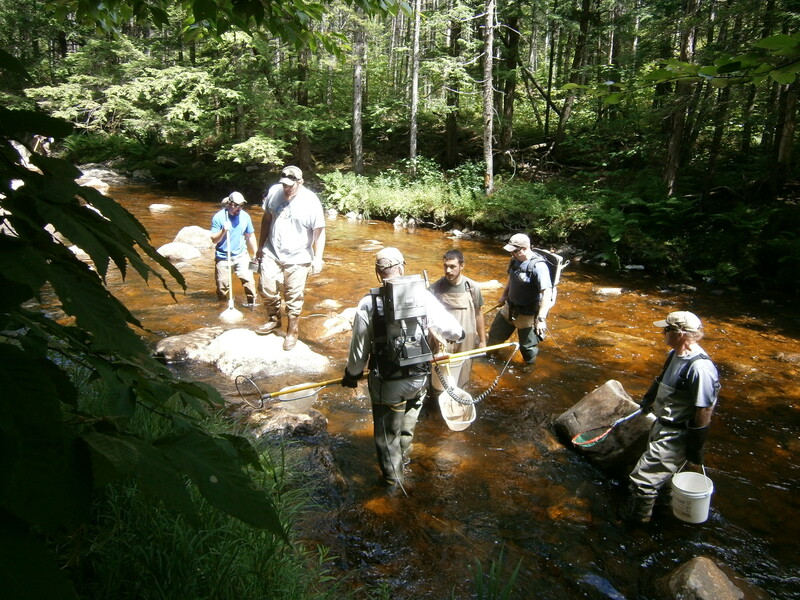 In this project, we take a multi-level approach to evaluate ecological stress in New Hampshire streams at the community, population, and molecular levels. This project has five main components: 1) field sampling of macroinvertebrates to provide community and population metrics of ecological response, 2) laboratory-based stress experiments to determine heat shock protein (HSP) induction thresholds for thermal-salt stress in two mayfly genera, 3) field sampling and HSP expression assays of mayfly nymphs from streams that span a thermal and salt gradient to determine the utility of HSPs as biomarkers of stress in wild populations of mayflies, 4) continuous monitoring of conductivity, water level, temperature (stream and air), and 5) snapshot water chemistry (anion and cation) sampling to coincide with macroinvertebrate sampling. This research team is led by Dr. Villamagna (Environmental Science and Policy Dept) and Dr. Brigid O’Donnell (Biology Dept). Our current research team includes Environmental Science and Policy graduate students Matthew Mazzone (’17) and Roy Fruit (’17) and Environmental Science and Policy undergraduates Ryan Duquette (’17) and Thomas Lafortune (’17). This project is funded by New Hampshire Water Resources Research Center – USGS NIWR and Plymouth State University. The Beebe River is a tributary to the Pemigewasset River (New Hampshire) and the Merrimack River (New Hampshire & Massachusetts further downstream). Five of the seven tributaries that feed the mainstem are impacted by undersized road crossing and water temperature in the mainstem during late summer months is hypothesized to limit the presence of EBT. This program is multifaceted, focusing on habitat improvement and wildlife population monitoring. 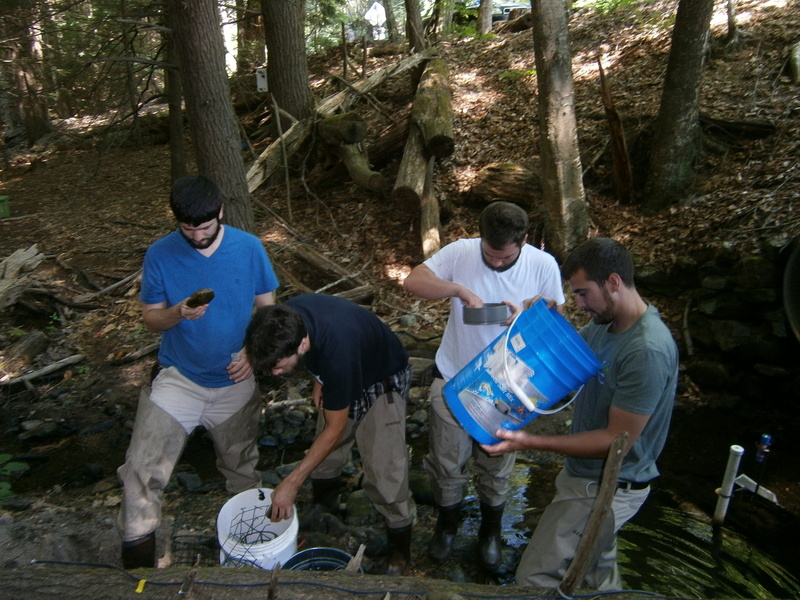 The research program, established in Summer 2016 in collaboration with NH Fish and Game Dept, The Conservation Fund, and the Pemigewasset chapter of Trout Unlimited, was developed to monitor freshwater and riparian ecological conditions and assess culvert replacement efforts on the wild Eastern brook trout population, as well as other coldwater fish and macroinvertebrates. The project blends an array of continuously logging environmental sensors for air and stream temperature, stream stage, and specific conductance and wildlife cameras focused on pools with snapshot water sampling, fine-scale in-stream habitat and riparian zone assessment, macroinvertebrate sampling, and electroshocking and tracking of wild brook trout. This research team is led by Dr. Villamagna (Environmental Science and Policy Dept) and Dr. Brigid O’Donnell (Biology Dept). Funding and support for this project comes from Plymouth State University Cluster Initiative, NH Fish & Game Dept, The Conservation Fund, and Trout Unlimited-Pemi Chapter. The research team includes: Dr. Amy Villamagna (Environmental Science & Policy), Dr. Brigid O’Donnell (Biology), Tyson Morrill (Biology graduate student ‘18), Nick Schola (Interdisciplinary Studies undergraduate student ’19), Griffin Nyhan (ESP undergraduate ’20), and Zach Newcity (ESP undergraduate ’18). This project addresses several high-priority challenges including enhancing the performance and accessibility of roads for alternative modes of transportation, promoting sustainability, increasing alternative modes of mobility by residents and tourists, and preparing for a future that promotes environmental, social, and economic well-being in a growing New Hampshire. This project in conducted in close collaboration with partners from the Bike Pedestrian Technical Advisory Committee, NH Healthy Eating Active Living program, Bike – Walk Alliance of NH, and representatives from prominent regional planning commissions (Central NH and Nashua). This project leverages a) existing datasets (participatory mapping of facility activity through the Strava App), b) statewide on-the-ground bike-ped monitoring initiatives (conducted in partnership with the 9 regional planning commissions in NH), c) the development and application of a spatially explicit Level of Traffic Stress (LTS) model for bicycling. It incorporates novel public participatory GIS approaches to assess patterns of current bicycle activity and identify potential barriers to access and participation. In the next year, this project will focus on 1) evaluating Level of Traffic Stress along common bicycling routes, as noted by Strava, and along routes to and from key community destinations, 2) validating and revising as needed the LTS model and GIS tool, and 3) assess impacts to LTS and observed bicycling potentially attributed to road paving and construction. This project is led by Dr. Amy Villamagna (Environmental Science and Policy) and is funded by New Hampshire Department of Transportation.